One of the most important steps in achieving a great finish on a scale model is preparing the surface for painting. 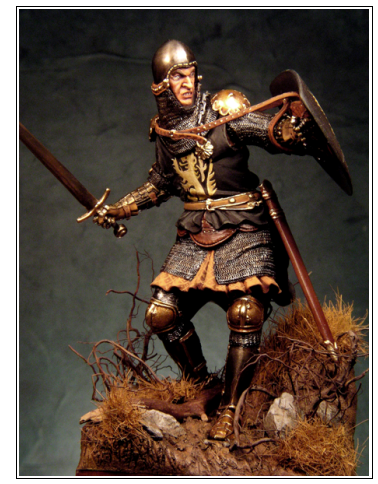 And although figures are the "main event" of this article, these steps can be taken with all miniatures. The one thing that sets figure modeling apart from standard models is the face and flesh portions. 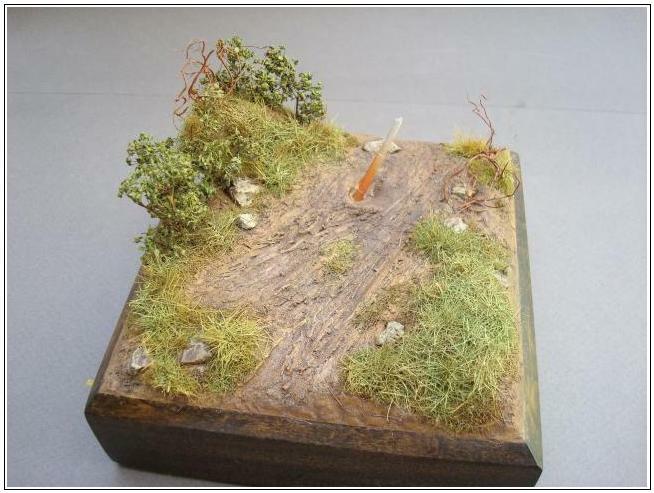 When we look at a scale model diorama of a scene with an aircraft and pilot, or perhaps an armored fighting vehicle with a driver or maybe a train with civilians inside, our eye is drawn to the human element first, why? Because this is something we are all familiar with. A face that isn't painted properly is immediately noticeable; after all we look at faces every day! The first step in achieving a well-executed figure is to have a comfortable work place with good lighting. One of the nice things about figure modeling is that it doesn't take a lot of room; you don't really need anything elaborate, just a quiet corner where you can concentrate on the work at hand. Good lighting is absolutely essential as well. You want bright light, but not from a single source. This will cause shadows and make it hard to see what's going on with your work. A better option is to have two light sources from both sides of your worktable. I personally like two small tube lights with 13-watt bulbs on both sides. This gives a "warm" effect and makes all the flaws easier to detect. The next step is to choose a subject for painting; a good figure that is well sculpted and well proportioned is absolutely vital. Proportioning is very critical when it comes to selecting a figure to paint. No matter how great the paintwork is, it will not hide the flawed proportions. Developing an eye for anatomy is very important in figure modeling. Start with subject matter that inspires and excites you, and then shop for the very best figure you can find. There are numerous manufacturers out there today with amazingly beautiful sculptures available in kit form. The choices are almost endless, as is the subject matter. In the last few years the giant steps sculptors and modelers have taken in all scales is phenomenal, the figures are really true works of sculptural art in miniature. The range of possibilities continues to widen. Many accessories, heads, hands and sculpting materials are available; it is up to the modeler's imagination to take this reality a step farther. A good miniature opens a door to another world, a dreamlike place that has endless possibilities. There are now heads as small as 1/48 scale that depict an accurate portrayal of a personality! Scale figures are usually cast in resin, metal, or plastic and depending on the manufacturer can sometimes have a rough finish. Air bubbles and distortion are common flaws in resin and metal figures, and need to be addressed before proceeding. A good primer is absolutely critical. I would suggest Tamiya "Super Fine" gray or white primer, this is a lacquer based primer that really "bites" the surface and is ultra smooth. Another very good primer is "Touch 'n' Tone" automotive primer, as well as the old Floquil model railroad primer. These all have xylene and toluene in the formula and adhere to the resin or metal surface with permanency. You will be amazed, after spraying on the primer, how even a good looking casting that "seems" almost perfect will sometimes show many minute flaws! After finding the flaws, cover the surface of the figure with a diluted solution of automotive primer. A red spot putty, such as "Evercoat" automotive putty is a good choice. Mix a little acetone with it and cover the entire surface. The reason for covering the entire surface is to get an even and uniform appearance. After the drying time, sand the surface with various grits of fine sandpaper, and then finally finish with a Scotch Brite or similar scouring pad. Re-prime the figure and see what it looks like. This process may take three or four tries before everything is ready. On the seams, such as joints where the arms or legs attach, the head and hands etc. two-part epoxy putty is the way to go. 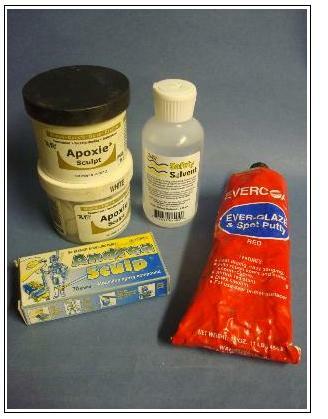 Aves, or Magic Sculpt are good choices, but any two-part putty will work well. This putty dries rock hard and will not shrink. Once the figure is finally prepared, primed and ready for painting, drill some small 1/16"-1/8" holes in the heels of the shoes and insert small brass or stainless steel pins and glue in place with five minute epoxy. Let the pins extend out about 3/4"-1" from the bottom of the feet. It's now time to start thinking about the base or "setting" on which the figure will be displayed. 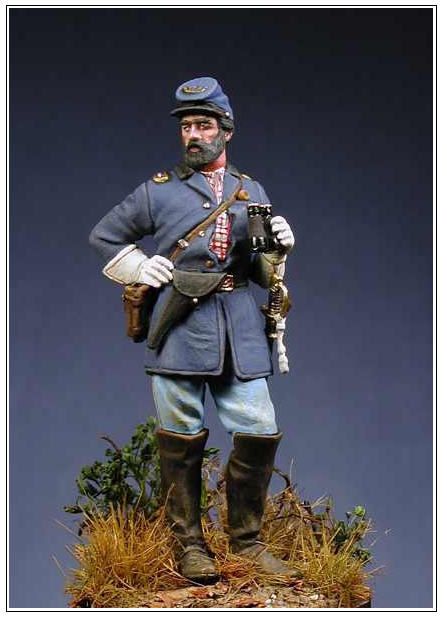 Get a nicely turned wooden base or wooden pedestal to mount the figure. Groundwork for the figure is very important, whether it's a simple grass lawn setting or a street scene, or perhaps a portion of a house or building in the scene. Take the time it needs to come up with an appropriate setting for your piece. The basic groundwork can be applied with a two-part epoxy putty, then the figure and its mounting pins can be "set" into the putty while it is still soft. Once the groundwork is composed it's time to return to the figure. At this point you should mount the piece on a temporary wooden block or base that will be comfortable for the painting process. Something about 2"-3" in height and about 2"x2" square is about right. Drill holes for the pins attached earlier, and mount with a small amount of super glue to hold the figure temporarily in place during the painting procedure. Regarding paint brushes: buy only the very best! There are several good brands including Isabey, Grumbacher, and many more. But in my humble opinion, Winsor & Newton Series 7 are hands down the absolute best. They are a little more expensive, but will give you what you're looking for. Each brush is individually handmade of the finest red sable. The sharp point is what really distinguishes it from cheaper brands. The first couple of millimeters are very critical when it comes to figure modeling. Types of paint to use are really a matter of preference. But in this day and age, acrylics seem to have taken over. Not only in figure modeling, but with canvas painters as well! 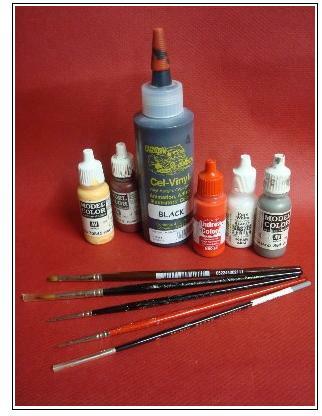 There are many brands to choose from, but the most commonly used acrylic paint for figures is "Vallejo" from Spain, this particular brand is excellent. Others that are on a par with Vallejo include Andrea, Reaper Master series, and Cell-Vinyl animation colors. In closing, I would like to add that figure modeling is an extremely rewarding hobby that can add "life" to a static model or stand alone as a single presentation. The procedure for figures is something that needs to be learned through experience, but when this is achieved the results can be very satisfying. Practice makes perfect as they say.